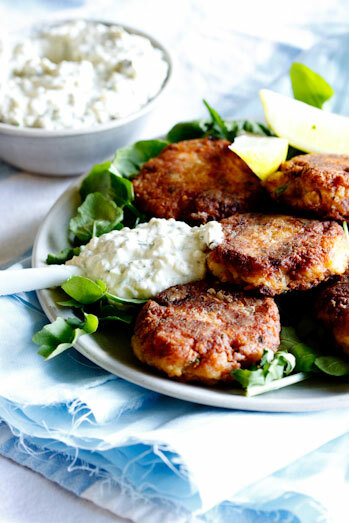 Delicious smoked snoek fish cakes uses a uniquely South African fish to make a homey comfort food even better when served with tartar sauce. 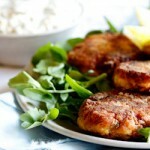 As someone who loves fish and seafood I was surprised when a reader asked me for a recipe for fish cakes a while ago. I realised that I don’t have one! 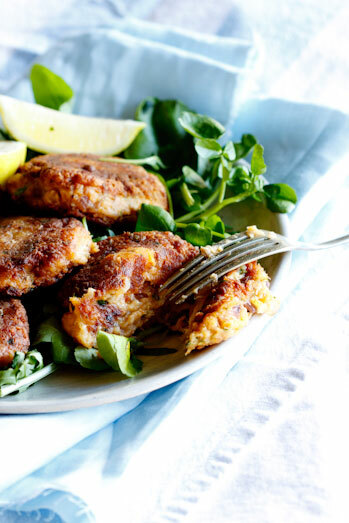 I have always liked fish cakes but for some reason, I’ve never made them for my family which is really quite bizarre as they are easy, delicious and served with a salad, they make a really great week-night meal! I set out to develop my recipe and thought of using smoked snoek only because I love it so very much. You can use smoked mackerel or smoked haddock as well if you can’t find smoked snoek but the snoek really does have a very distinctive flavour. It’s also a South African favourite and it’s normally served with lashings of melted butter and apricot jam after being braai’d. It is absolutely delicious. I wanted to incorporate an apricot element to the dish and didn’t quite know how to do this when I realised that I’d have to serve my fish cakes with a dipping sauce of some type. Tartar came to mind and I immediately thought of adding apricot jam to the mayonnaise I was planning on making and adding some soaked and finely chopped dried apricots to the finished tartar. 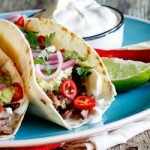 Now, I am the first to admit that I don’t normally like fruit in savoury dishes. There’s something about it that gives me the heebie-jeebies but with this it just worked. The apricots complimented the snoek perfectly and added a nice texture to the tartar. I served the fish cakes with a salad made from rocket, baby spinach and watercress with lashings of the home-made tartar sauce (which is by the way, one of the bests I’ve ever tasted, if I have to say so myself). 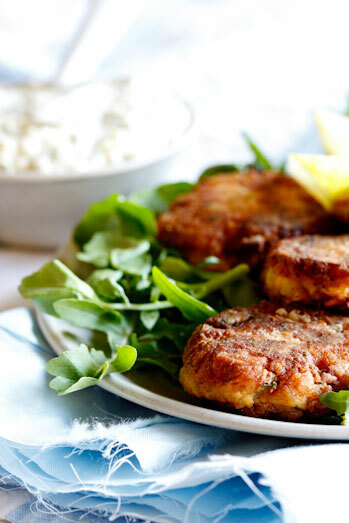 To make the fish cakes, fry the onion and garlic in olive oil until soft and translucent. Allow to cool slightly. In a large bowl, combine the smoked snoek, cooked potatoes, onion mixture and rest of the ingredients and mix well. Check the seasoning and adjust. Form handfuls of the mixture into fish cakes and dust with the seasoned flour. 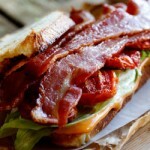 Place on a greased tray and refrigerate for 20-30 minutes. In the meanwhile, make the tartar sauce. In a blender, combine the egg yolks, mustard, lemon juice, apricot jam and salt. Blend for 30 seconds. With the blender running, slowly pour in the canola oil. If the mayo gets a bit thick, you can add a few tbsp water before continuing with adding the oil. Taste the mayo and adjust the seasoning. Add the chopped gherkins, capers, apricots and parsley and adjust seasoning again. 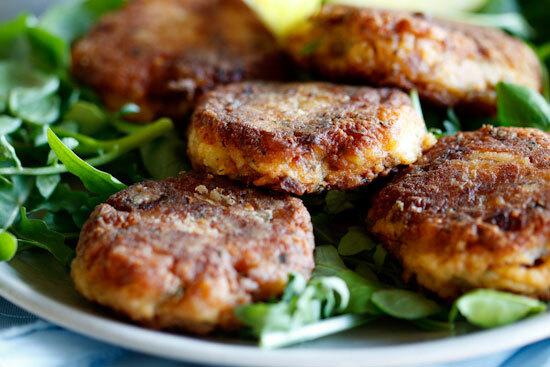 To cook the fish cakes, heat canola oil in a large frying pan and fry the cakes until golden brown on both sides. Drain on kitchen paper and serve with the tartar sauce and salad.